ANEZipFile is a native extension to zip/unzip files on iOS. It uses a slightly modified version of SSZipArchive Obj-C and is able to perform several actions, such as listing the archive content. Some operations can be executed asynchronously for improved performance. 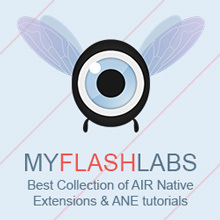 Air Native Extension, iOS CC-BY-SA 3.0. URL. Hi, is this ANE working on mobile application (ipad) ? With iOs 5 and iOs 6 ? Hi! I had no change to test it, but I believe it is working with iPad. You can get further info from the author.